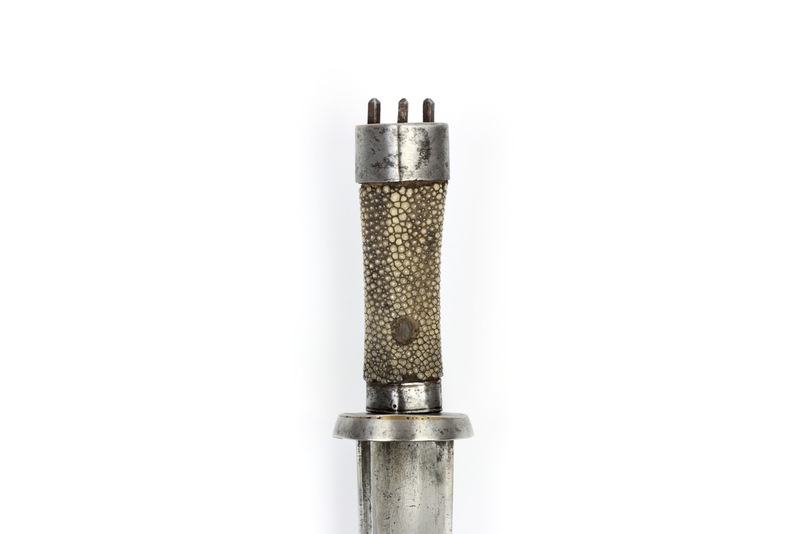 An interesting Tibetan shortsword with acute point. Its blade has a narrow groove on each side that runs near the spine along most of the length of the blade. The blade is hollow ground on the left side and flat ground on the right side. It has a secondary bevel on both sides. The blade shows signs of a laminated construction, being forge folded in the Chinese fashion with inserted, high carbon edge, rather than the hairpin laminations that are standard practice on swords in the Tibetan cultural sphere. 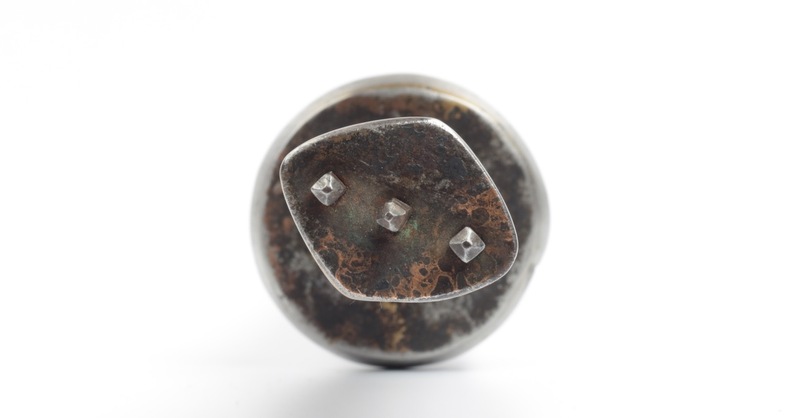 The handle is of lozenge cross-section with simple fittings of iron or steel plate, brazed together with brass. The guard is a small round cup guard, inspired by similar guards on Chinese swords. 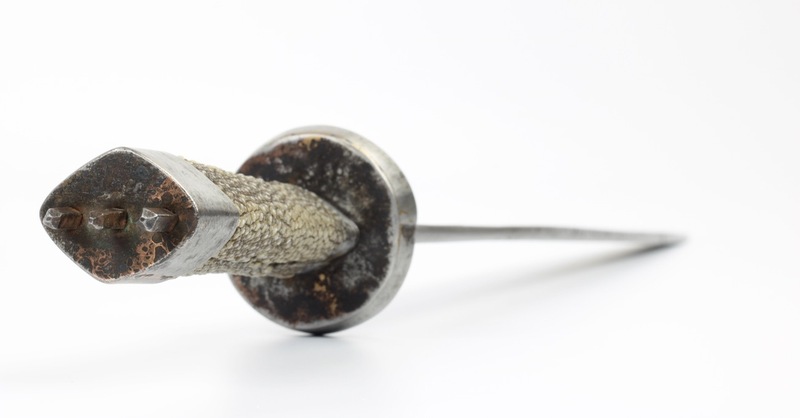 The pommel has three protrusions, a feature that is common on swords from the Kham region, a place that lies in present-day southeast of Tibet with some overlap in what is now Sichuan province. The wooden handle is covered with ray-skin. There is a round cutout in the ray-skin on the front side, exposing the wood below. This is intentionally done because it runs right through the hard pebbles of the ray skin, whereas lost patches would follow the softest part of the material right between the pebbles. 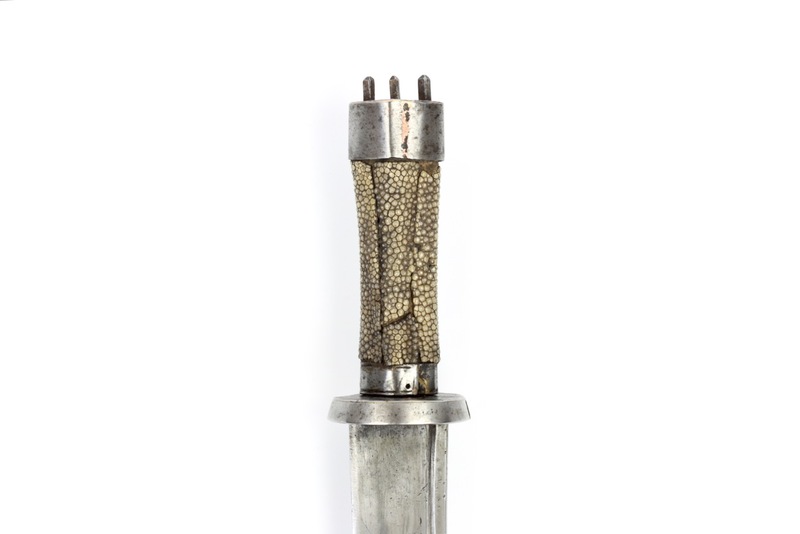 The bottom two-thirds of the wooden scabbard are protected by a metal U-frame with a reinforcing brass strip on the front side that widens on the bottom. U-frame and brass band are nailed to the scabbard at the bottom, and held together at the top by a brass band. The wooden scabbard is covered with green leather between the frame, and the bare part on top is covered with indigo dyed cotton, faded over time to a blue-green. This is a shortsword, with acute point, like the example that is subject of this article. Handle with lozenge-shaped cross-section but this time in beautiful gilt iron openwork. Handle is covered with leather. 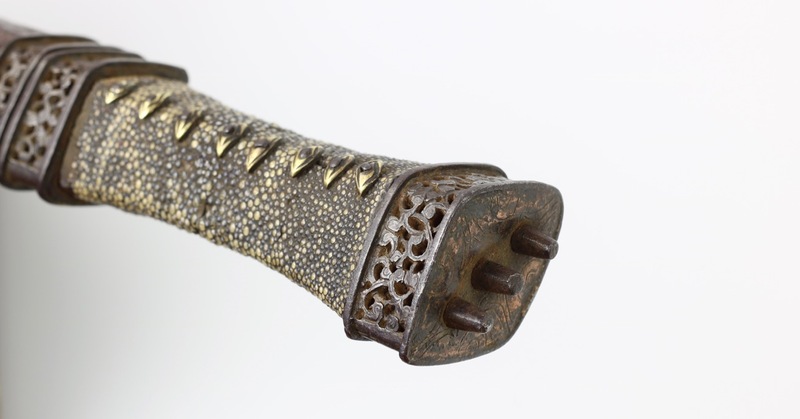 It retains its leather covered scabbard, also with elaborate openwork in gilt iron. A Tibetan shortsword we sold last year. It also has the three protrusions from the pommel. Like the one currently discussed, this piece also had an asymmetric blade cross-section, in this case in the form of a secondare bevel only on the left side of the blade. The right side was completely flat. 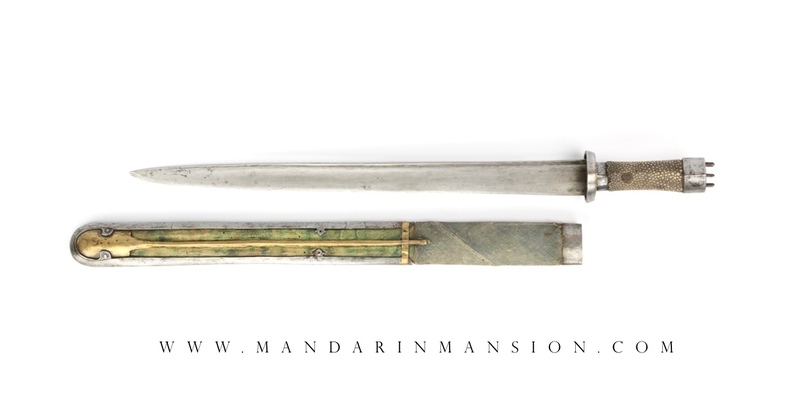 A very rare type of Tibetan shortsword that is peculiar to the Kham region, covering the southeast of present-day Tibet and a part of western Sichuan. Geographically right in-between Bhutan and China, it bears similarities to sword design of both these cultures. 1. The same sword is published in La Rocca, Donald J.: Warriors of the Himalayas: Rediscovering the Arms and Armor of Tibet . New York: The Metropolitan Museum of Art, 2006. Catalog number, 68, illustrated on page 165. 2. Ibid, catalog number 69, illustrated on page 166. 3. Ibid, catalog number 70, illustrated on page 167.